Clover was supposed to be a lucky girl. After all, isn’t her name the luckiest of names? But all the charms and finger-crossing in the world can’t change things: she’s actually terribly unlucky. When her canary escapes, it’s just her luck that she flies into the forest, a forest that Clover has already heard is full of beasties. But still, Penny was her bird, and Clover has to take care of her! So she ventures into the woods after her flyaway pet, and discovers a place full of the most fantastic pets she has never heard of before. When she sees a posted flyer seeking volunteers at the Magical Animal Adoption Agency, Clover knows it’s the place for her. She begins volunteering, and is soon feeding squashed flies to magical toads and trying to avoid being toasted by a baby dragon, who’s still learning to control his fiery breath. 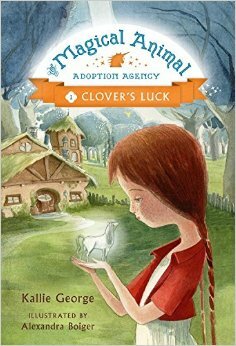 When the owner of the agency is unexpectedly called away, Clover is left in charge of the magical animals. There’s a lot to do! Not only do all the creatures need food and care, but she also has to make sure the people coming in to adopt her precious animals are good families who will treat the animals well. When a sneaky witch almost spoils everything, Clover has to save the day-and she learns that she’s not as unlucky as she thought. Fairy ponies! Baby dragons! Enchanted mood toads! It was enough to get me to review this book, even though it’s for an audience a bit younger than I typically review for. This one’s for the under third-grade crowd, or those kids who can’t get enough glitter fairies. Posted on July 15, 2015 July 15, 2015 by ShannaPosted in Ages 7-10, SeriesTagged magic, magical creatures.